Look, I realize this is pandering to the lowest common denominator of cesspool gossip, but my mission is to illustrate gossip...and so I do what I must. My inspiration comes from the fact Britney Spears and Cheetos have become so synonymous that one term is rarely mentioned without the other. Just take a look at what the bloggers are saying. In addition, Star magazine has been monitoring Brit's weight gain over the past month and even ran a cover photo screaming "Brit Gains 20 lbs. MORE!" 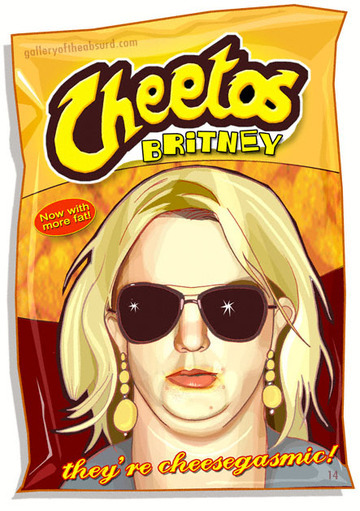 Our investigative team has just uncovered Frito-Lay's plans to expand their product line by offering Cheetos Britney, an even cheesier, greasier and more unnatural shade of orange crunchy snack. We were able to obtain a prototype image of the bag (see above) and also got our hands on the teaser ad (see below) scheduled to appear in upcoming magazines right before the product becomes available. This is what the ad will look like inserted into the pages of a sample magazine. Medium: Ink and digital color. Ever noticed the way Sea-Monkeys were marketed back in the 70's with the way tabloid celebrities are marketed today? Both Sea-Monkeys and tabloid regulars are promoted as entertaining and attention-loving creatures who live in a world of make-believe. Celebrity stylists, makeup artists, image consultants and agents all work together to transform a marginally talented person into a super-hyped entity that seems to transcend normal human existence...just as Harold von Braunhut, creator of "Sea-Monkeys" was able to transformbrine shrimp into the illusion of playful and friendly aquatic simians who wore crowns and lived in castles. Above is my version of the ad as I imagine it would look in the pages of Star magazine. Below is the original advertisement that appeared in the comic books of the 70's. 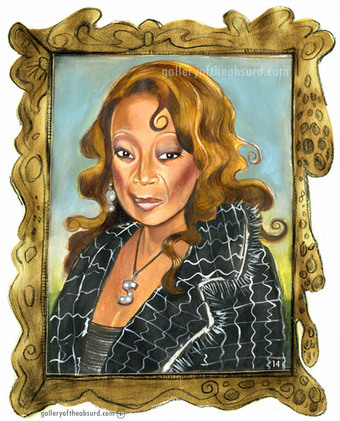 While in the middle of painting the Star Jones pin-up for Babe Magazine (see above), I felt I needed to look at her face once again before adding the finishing touches. I wanted some recent photos, so I went to getty images. When I pulled up the photos, I nearly fell over backwards!! WHAT HAS SHE DONE TO HER FACE? It's too late at night for me to be looking at photos as blood-curdling at these! I know faces change appearance after dramatic weight loss, but Star looks really different. I compared the much maligned Star-in-red-bathing-suit image from a few weeks ago with the photos from her recent book signing and she looks like a different person. She looks like a very startled big-eyed alien. I hereby bequeath her a new moniker: Startled Jones. While on vacation I was flipping through a few gossip tabloids. Most of the photos and articles are pretty much the same dreck week after week, but one small blurb caught my eye: Madonna Wine. Yep, that's right. Now you can drink the essence of Madonna with her new "Confessions on a Dance Floor" line of collectible bottles. Doesn't this woman have enough money and exposure? Ah well, I'll take care of Madonna and her material empire in an upcoming post. Now let's take a look at Tara Reid. If a company really wanted to sell booze, the best thing to do would be to put Reid's mug on the label. 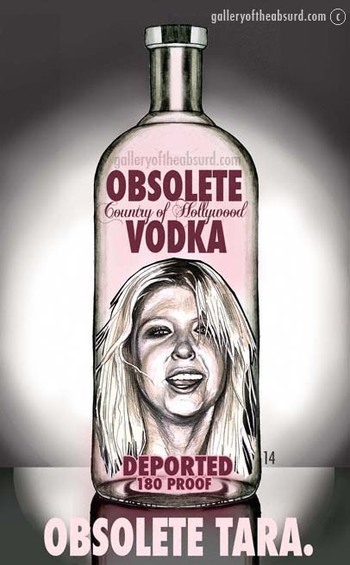 A liquor company such as Absolut could license Tara's image and then she could go on a worldwide drinking binge while promoting the company. The campaign would generate millions for the company even though they'd have to endure a few minor embarassments (Anna Nicole Smith and Trim Spa come to mind). Page Six referred to Tara as a C-List Booze Beast just recently, so it seems that Tara won't be ridding herself of the "party girl" label any time soon. Tara honey, it's time to cash in on your disgrace. 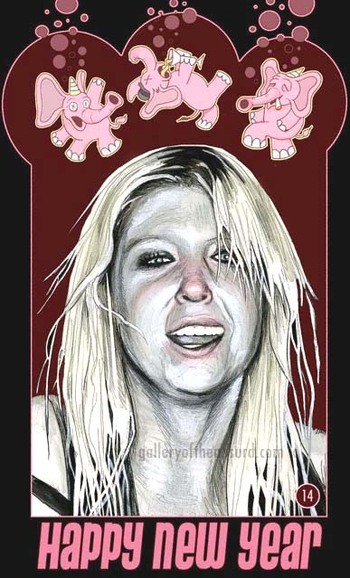 Tara Reid and her cast of Pink Dancing Elephants wish you a happy and prosperous 2006. Tara says "May your heart be filled with love, your spirit filled with joy, and your liver bloated with alcohol..PARTY!! WOOOOOOO!" Note to the nasty bloke in the U.K. who steals my Tara Reid images and then obscures my name and puts his own: If you want to take them and add them to your collection of drunken Tara Reid photos, please link them back to Gallery of the Absurd. 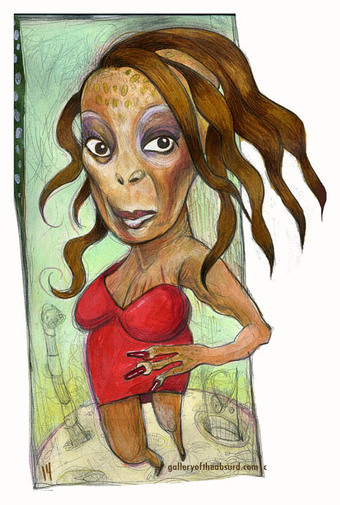 Besides, there's an infinite number of drunk Tara Reid photos out there, so no need for you to swipe my illustrations, k?